Pom-pom rug round - Discover a lot of free projects and embroidery patterns! Pom-pom rugs are a big trend right now. This cosy round rug is sure to be the perfect touch for your home. The “Zweigart Twist” canvas is used as the base mesh. The holes in the mesh make it easy for you to fasten your pom-poms to the canvas and make for quick success. What’s more, the canvas is very sturdy thanks to the twisted mesh threads and it can be cut into any shape you want. Then you can get started! DArrange the material you need. The “Zweigart Twist” canvas (Item no. 9699) is used as the underlay for this colourful rug. The holes in the mesh make it easy for you to fasten your pom-poms to the canvas and make for quick success. What’s more, the canvas is very sturdy thanks to the twisted mesh threads and it can be cut into any shape you want. You can also use your wool yarn remnants which you’ve accumulated over the past few years. Wool in various shades of blue was used in this case. The pom-pom are very quick and easy to wrap. You will need a total of approx. 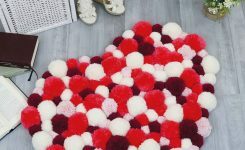 36 large pom-poms and 98 small pom-poms to make this round rug, approx. 70 x 70 cm in size. The individual pom-poms are always put together from two halves to form a single pom-pom. The pom-pom shapes from Prym have four template parts for each size. You need two template parts for each half-pom-pom. Start with the first half of a pom-pom by placing two of the template parts on top of one another so that the two little feet point outward and the tiny elevations in the parts form a small gap in the centre. You will need this later so that it will be easy to cut the wrapped threads apart. Now, wrap around the template parts with a thread of wool in even rows until it forms a nice-looking semi-circle. You can also wrap with 2-3 threads at once to speed things up a bit. Now do the same thing with the other two template parts in yellow, so that you then have two wrapped semi-circles. Now, use U-shaped clips to put the pom-pom halves together on the little feet of the template parts to form a circle. Now, use the scissors to cleanly cut apart the threads of the wrapped semi-circles in the gap in the templates. You will now need a single wool thread about 30 cm long in order to finish the pom-pom. Wrap it around the pom-pom threads in the gap in the template parts and tie it securely as explained in the next step. In order to prevent the knot from bouncing back and loosening, the best thing to do is tie a triple knot the first time. To do so, wrap the one half of the thread not just one time around the other half, but three times. After that, you can tie a simple double knot around it to secure it. Now the pom-pom is fastened firmly in place. Now you can carefully remove the template parts from the pom-pom. Now, use the scissors to cleanly cut off all of the threads which are too long and don’t look good sticking out of the pom-pom so that you have a nice and round ball. But make sure not to cut off the thread which you used to tie the pom-pom together with – you will need it later to fasten your pom-pom to the canvas! Your first pom-pom is now finished. Now, wrap further pom-poms in different colours in both sizes until you have 36 large pom-poms and 98 small pom-poms. Now, cut the canvas to your desired size – in this case, a circle with a diameter of 70 cm. The best way is to take two pencils and use them as a compass. To do so, fasten one thread to the end of a pencil. The thread between the pencils should be 35 cm when under tension. Now, hold the one pencil firmly in the centre of the canvas and use a trick marker with the taut thread to draw a circle around this pencil. To prevent the canvas from shifting or rippling, fasten it at the corners with 4 heavy objects. Then cut the circle out along the line you’ve drawn. To prevent the canvas from fraying under daily use, you can use the sewing machine to sew the blue bias tape one time all the way around the edge. Now you should think about how you want to arrange the pom-poms on your rug. In doing so, make sure to distribute the various colours and sizes on the canvas in a nice and even manner. 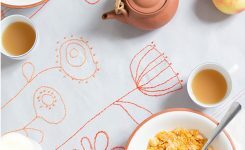 To do so, arrange your pom-poms on the canvas roughly the way you want them and take a picture of your arrangement so that you can always have a look later when you’re fastening the pom-poms to see how you planned your rug. The best thing to do when fastening the pom-poms is to work in circles or rows from the outside to the inside. This will make your rug nice and even. No bias tape or gaps between the pom-poms should be visible in the end. You can use either a large needle or knotting hook to fasten your pom-poms. But it’s also easy enough to do with a normal hair clip. Just clamp the two threads protruding from the pom-pom into the hairpin and pull the hairpin through two threads in the canvas. Then, wrap the thread around the pom-pom and tie the threads firmly in a double knot. Make sure your pom-pom is seated firmly on the canvas after you’ve tied it and not dangling loosely from it. Now you can cut off the two threads with a bit of distance to the knot. Now, fasten all of your pom-poms with a spacing of approx. 3 – 6 cm each between the individual pom-poms. You might have to diverge from your pom-poms plan from time to time because a few unplanned gaps appear between the pom-poms. You should simply fill these with pom-poms, even though they’re not in your plan. This way, your rug will also look tidy and orderly from behind too. Check one more time to make sure you have fastened all the pom-poms firmly to the canvas, and then you’re done! The rug is finished and can’t wait to have a nice place in your home.